Shop for Spyderco knives at AAPK! You will find that great Spyderco knives pop up for sale in the AAPK member stores on occasion. You will often find new old stock, hard to find discontinued models & current production models in many different colors & configurations. Spyderco Paramilitary 2 with CTS-204P blade steel. Foliage Green G-10 handles. BNIB. C81GPGR2. ..
Spyderco Paramilitary 2 with M4 blade steel. Natural G-10 handles. Clip was changed to tip up carry. Spyderco Paramilitary 2 with M4 blade steel. Natural G-10 handles. Clip was changed to tip up carry. I see a few spots of patina starting on the blade..
Spyderco Paramilitary 2 with M390 blade steel. Red G-10 handles. Clip changed to tip up carry. Spyderco Paramilitary 2 with M390 blade steel. Red G-10 handles. Clip was changed to tip up carry. LNIB. C81GPRD2..
Spyderco Paramilitary 2 with S30V blade steel. Pink G-10 handles. BNIB. C81GPNP2..
Spyderco Para 3 with black DLC coated S35VN blade steel. Earth Brown G-10 handles. BNIB. Distributer exclusive. 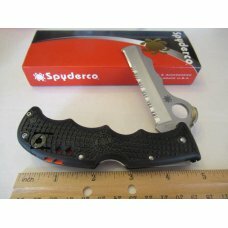 FREE SHIPPING..
Spyderco Paramilitary 2 with 20CV blade steel. Tan G-10 handles. BNIB. C81GPTN2..
Spyderco Para 3 with CTS-XHP blade steel. Orange G-10 handles. BNIB. C223GPOR..
Spyderco Paramilitary 2 with black DLC coated S35VN blade steel. Earth Brown G-10 handles. BNIB. C81GPNBK2. Distributer exclusive. FREE SHIPPING!!!.. Spyderco Native 5 Lockback Salt with LC200N blade steel. Yellow textured FRN handles. BNIB. C41PYL5 FREE SHIPPING..
Spyderco Native 5 Lockback Pink Heals with S30V blade steel. Pink textured FRN handles. BNIB. 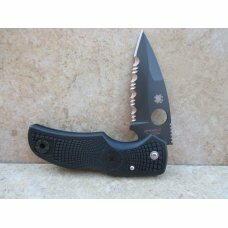 C41PPN5 FREE SHIPPING..
Spyderco Paramilitary 2 with. DLC coated S30V blade steel. Custom Flomascus Titanium handles. Lynch Northwest deep carry Titanium clip. This knife has..
Spyderco Paramilitary 2 with S110V blade steel. Blue G-10 handles. BNIB. 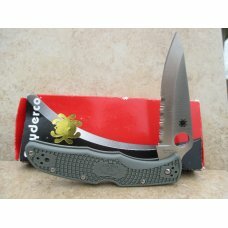 C81GPDBL2 FREE SHIPPING..
Spyderco Paramilitary 2 with S30V blade steel. Black G-10 handles. BNIB. C81GP2 FREE SHIPPING..
Spyderco Manix 2 with S110V blade steel. Blue G-10 handles. BNIB. 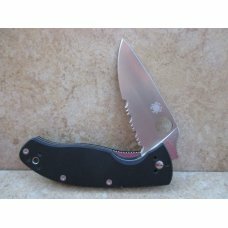 C101GPDBL2 FREE SHIPPING..
Spyderco Native 5 Lockback with Maxamet blade steel. Gray textured FRN handles. BNIB. C41PGY5 FREE SHIPPING..
Spyderco Para 3 with S110V blade steel. Blue G-10 handles. BNIB. C223GPDBL. FREE SHIPPING!!!.. Spyderco Paramilitary 2 with S35VN blade steel. Earth Brown G-10 handles. C81GPBN2. BNIB. ..
spyderco Police Model G-10 Handle Model CO7GP3 Made In Seki City Japan VG-10 Steel never sharpened or carried New in Box G 10 Handles are Factory Fr..
Spyderco Seat Belt & Glass Breaker Model # C79PSBK Made in Seki Japan New in Box never carried or sharpened Locks up Tight , No wobble Comfort Gri.. Older Spyderco Serrated Military Model C36GSE Made in Golden Colorado New in Box never carried or sharpened . CPM-S30V Steel Handle of G-10 Factory ..
Spyderco Black Pearl By Santa FE SToneworks Model Kiwi New in Box Factory edge never carried Black Pearl with no cracks or chips VG-10 Steel Made in..
Spyderco Police Model . New old stock never carried or sharpened,no wobble . VG-10 Steel made in Seki City Japan . 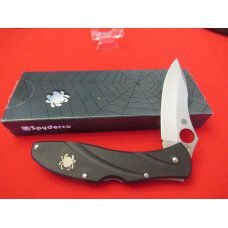 Comes in older white Spyderco Box ..
Spyderco Centofante Model C66PBK3 new in box never carried or sharpened . Factory fresh handles . VG-10 Steel made in Seki City Japan . Thanks for loo..
Spyderco CPM S30V Taiwan Green & Blue C188ALTIP Dog Tag Folding Neck Knife in Box -Titanium Handles - No Cracks - Very Nice Unused Condition in the O..
Spyderco VG-10 Seki City Japan C12SBBK2W Matriarch 2 Emerson Opener Serrated Knife in Box - Black Fiberglass Reinforced Nylon Handles - No Cracks - Lo..
Spyderco Seki Japan LBL Serrated Blue Ladybug Tactical Lockback Knife in Box - Locks up Tight - No Wobble - Nice Unused Condition in the Original Box..
Spyderco VG-10 Seki-City Japan C28S Serrated Dragonfly Tactical Lockback Knife - NIB - Locks up Tight - No Wobble - Near to Mint Condition in the Or..
Spyderco VG-10 Seki-City Japan C11PSBK Partial Serrated Delica Tactical Lockback Knife - NIB - Reversible Pocket Clip - Locks up Tight - No Wobble -..
Spyderco VG-10 Seki-City Japan C45SBK Serrated 79mm Rescue Tactical Lockback Knife - NIB - Locks up Tight - No Wobble - Near to Mint Condition in th..
Spyderco VG-10 Seki-City Japan C10SBK Serrated Endura Tactical Lockback Knife - NIB - Reversible Pocket Clip - Locks up Tight - No Wobble - Near to ..
Spyderco Yojimbo with black DLC coated M4 blade steel. Natural G-10 handles. BNIB. C85GM4PBK2. ..
Spyderco Paramilitary 2 with black DLC coated M4 blade steel. Natural G-10 handles. Clip was changed to tip up carry. NIB. C81GM4BKP2. ..
Spyderco Paramilitary 2 with M390 blade steel. Blue G-10 handles. Clip changed to tip up carry. Spyderco Paramilitary 2 with M390 blade steel. Blue G-10 handles. Clip changed to tip up carry. LNIB. C81GPBL2. ..
Spyderco Para 3 with REX 45 blade steel. Burnt Orange G-10 handles. BNIB. C223GPBORE.. This is a group of (3) early SPYDERCO knives. Three pattegns MATRIARC 2w,MANIX2BLK PIN,and ENDURA. All knives are miont condition and in original boxe..
1999 Spyderco Micarta Model C40P KHAI.SA Made in Japan New in Box never carried or sharpened. VG-10 Steel Micarta handles are factory Fresh Locks up ..
MAKER: Spyderco PATTERN: Endura LENGTH (Closed): 5” HANDLES: Gray FRN BLADES: Single blade of VG-10 steel TANG STAMPS: SPYDERCO/VG-10 .. Discontinued Spyderco Kiwi in Jigged Bone Handles with no chips or cracks . Pattern # C75P. Steel V G-10 . Made in Japan . Never carried or sharpene..
MAKER: Spyderco PATTERN: Starling 2; 2G-10P LENGTH (Closed): 2-1/2” HANDLES: G-10 BLADES: Single locking spear blade of 8Cr13MoV s.. If you need more info on this or any of my listings, please email me with questions or for additional photos. 2bb29 TOTAL NUMBER OF KNIVES : 1.. If you need more info on this or any of my listings, please email me with questions or for additional photos. 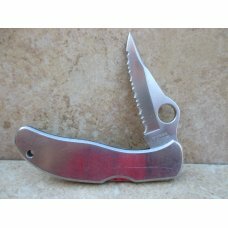 2bb25 TOTAL NUMBER OF KNIVES : .. If you need more info on this or any of my listings, please email me with questions or for additional photos. 2bb26 TOTAL NUMBER OF KNIVES : .. If you need more info on this or any of my listings, please email me with questions or for additional photos. 2bb30 TOTAL NUMBER OF KNIVES : ..